John L. Smith is moving from Fayetteville, Ark., and the University of Arkansas to Durango and Fort Lewis College  the Southeastern Conference to the Rocky Mountain Athletic Conference. Smith was hired at FLC on Wednesday to resurrect the Skyhawks downtrodden football program. If Fort Lewis College was looking to wake up its football fanbase after an 0-10 season, it may have found the ideal way to do it. John L. Smith, most recently the interim head coach at Arkansas, was announced as the 12th head coach of the Skyhawks today, effective March 1. Smith will replace Cesar Rivas-Sandoval, who was 6-25 in three years at the helm before resigning last week. Smith brings 19 years of head coaching experience at the Division I level and 40-plus years of overall coaching experience to Durango. 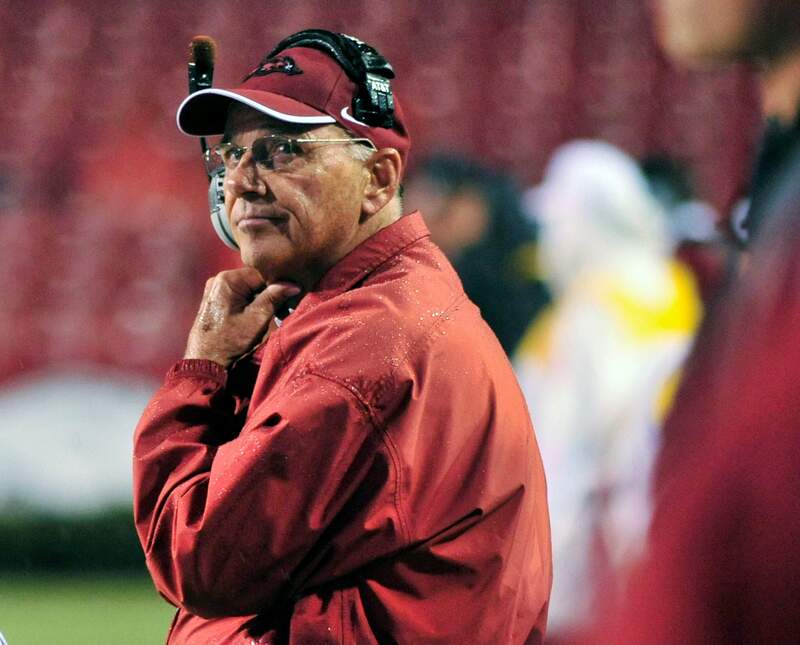 Most recently, he was not retained as interim boss at Arkansas after the Razorbacks stumbled to a 4-8 record after beginning the season ranked in the top 10. He took over that job after the dismissal of Bobby Petrino and eventually was replaced by former Wisconsin head coach Bret Bielema. His overall head coaching record is 136-93, with stops at Arkansas, Michigan State, Louisville, Utah State and Idaho, and his teams qualified for seven bowl games in his stops. He also was head coach at Weber State for nearly four months but didnt coach a game before taking over at Arkansas. Absolutely critical to the process was Smiths relationship with FLC president Dene Kay Thomas and athletic director Gary Hunter. Hunter hired Smith for his first head coaching job at Idaho on New Years Eve 1988, and Thomas closely worked with both men as an academic dean, creating the kind of friendships that helped land a longtime Division I coach at a floundering DII program. And after so many years in the business, Smith said its nice to work with people he enjoys in a comfortable environment. If I didnt know Dene Thomas, if I didnt know Gary Hunter, it certainly would never have happened, Smith said. For both Hunter and Thomas, Smiths hire was the kind of coup that could illustrate to administration, boosters and fans they are serious about getting the football program on the same level as FLCs other successful sports. Getting back to more of a grassroots style of coaching greatly appealed to Smith and was a factor in his decision to come to Durango instead of seeking more lucrative coordinator or head coaching opportunities at a larger institution. Smith won two Big Sky Conference titles at Idaho (1989, 1992) and went to the then-Division I-AA playoffs five out of six seasons in his tenure from 1989 to 1994. He won two Big West Conference titles in three seasons at Utah State, then took over the program at Louisville from 1998 to 2002, winning Conference USA crowns in 2000 and 2001 and a CUSA Coach of the Year award in 2001. Smith then was hired as head coach at Michigan State, where he remained from 2003 to 2006. The Spartans lost in the Alamo Bowl in his first season, one in which he earned Big Ten Coach of the Year honors after a 7-1 start, then failed to finish above .500 in his last three seasons. Contract terms have yet to be set, but Hunter said Rivas made in the neighborhood of $67,000 per year and added hes hopeful to pay Smith a bit more than that figure. Defensive coordinator Ed Rifilato will maintain oversight of the program until Smith assumes his duties. Rifilato played for Smith, who then was a defensive coordinator, at Idaho and was director of football operations in 2002 during Smiths tenure at Louisville. Smith said he hopes to keep Rifilato and evaluate the rest of the current crop of assistants during spring ball. Junior wide receiver Doyle Bode expressed excitement over the hire as well. Since Rifilatos 2006 squad won seven games, FLC has gone 11-52 overall and hasnt won more than three games in a season, culminating with this years winless mark, the first such season for the Skyhawks since 1998. The program is just 157-324-3 in its history. But the way a head coachs mind tends to work is that in the face of such numbers, he can succeed where his predecessors failed. And Smith hopes to be able to bring up the win total, keep players graduating and increase fundraising to create his kind of well-rounded program. Again, thats something you look at and go, Gosh darn, maybe I can make a difference. May be a little bit egotistical to look at it that way, Smith said. And financially, Smiths aware this isnt the Southeastern Conference or the Big Ten or even the Big Sky Conference. When I was at Idaho, it was I-AA, and we had to fight for every pay that we had. Its the same deal except maybe you have less scholarships. Youre fighting the same battle, trying to make a dollar stretch as far as you can stretch it, he said. In other words, the 64-year-old coach isnt prepared to shy away from an uphill battle. Especially one in a city such as Durango, where he can get in what he calls his mountain fix. Smith is an avid outdoorsman and adrenaline junkie, having climbed Mount Kilimajaro, run with the bulls in Pamplona, Spain, and myriad other extreme pursuits. Getting away from the Midwest and back to the mountains wasnt a bad selling point, either. When you move to this side of the country, as you know, you dont get to see mountains. And every year you have to get a mountain fix, Smith said. The FLC community is counting on Smith to deliver a long-awaited football fix, too  a winning football fix.